It was a crazy night in Pamplona last night. The only ones not running in the streets were the bulls. Every family within the region and all their extended family and friends must have been in the centre of town. The main plaza and all the cafés surrounding it were crowded and there wasn't a cafe seat out of thousands to be had. The main plaza was a check-in point for a Paris to Madrid Antique Car Rally and so the outer lane of the square was a line up of these antique beauties parked in the order they checked in. There were musicians, marching bands and dozens of folk dance groups, with dancers aging from five to seventy five or so, dancing in any street or square with a modicum of space and a appreciative audience available. 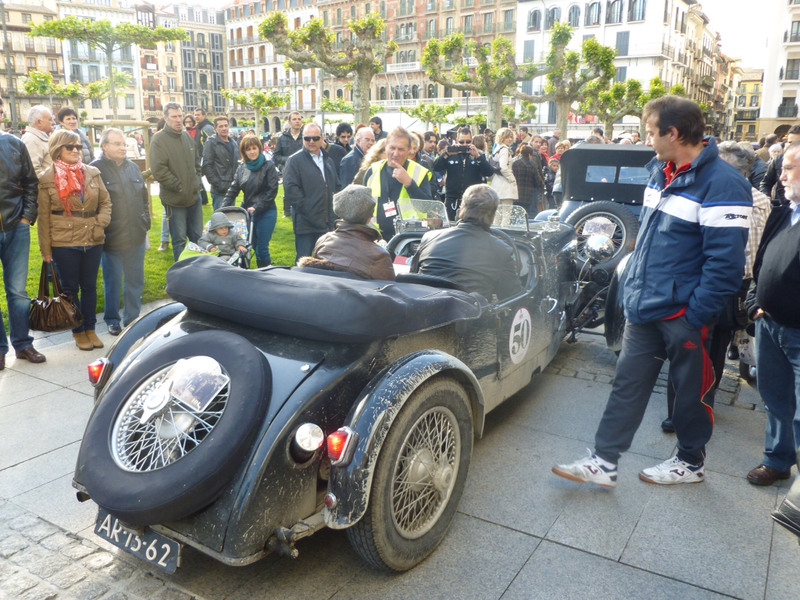 It was so loud and so busy that it was a quite a challenge to move through the streets but so interesting and fun. We watched the festivities and then scouted out a few pintxos bars for Dayton and we found some excellent ones. 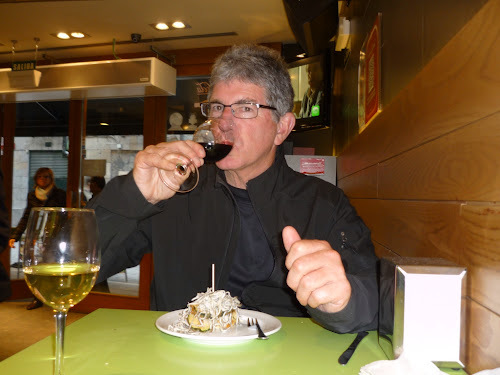 Dayton would describe his pintxos as amazing while I'd have other descriptors for baby squid tentacles. One pintxo was Serrano ham, chorizo sausage topped with a fried quail's egg, another was a mushroom stuffed with diced salmon and crispy prosciutto, a third was a sliced potato, Brie, topped with an anchovy, and then there was something with calamari and...well you get the picture, not any one a vegetarian's delight. 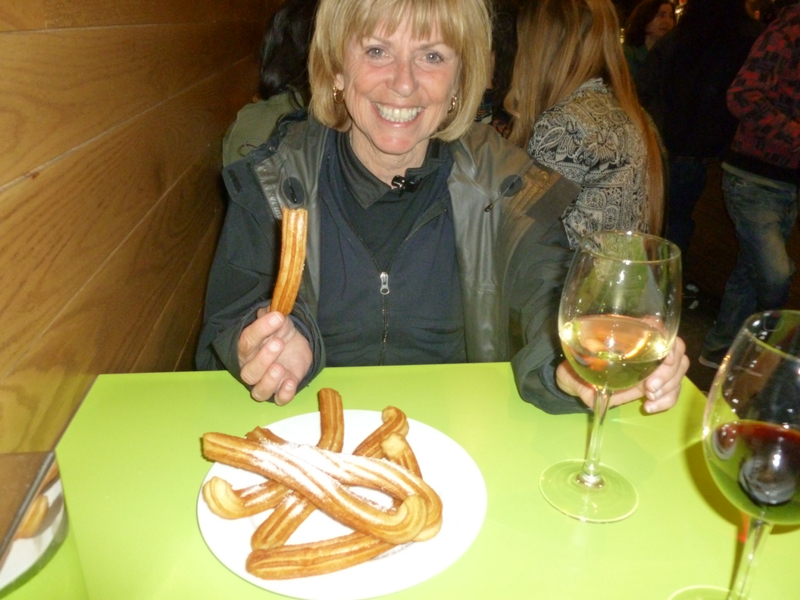 At the last place though I could get fresh made churros so churros and Chardonnay was my pintxo combo. What can I say, I was hungry by that time. Dayton and I were pretty proud of ourselves too; out on the town after 8:00 pm Saturday night. Basque Pintxo - Baby Calamari Tentacles on Toast! 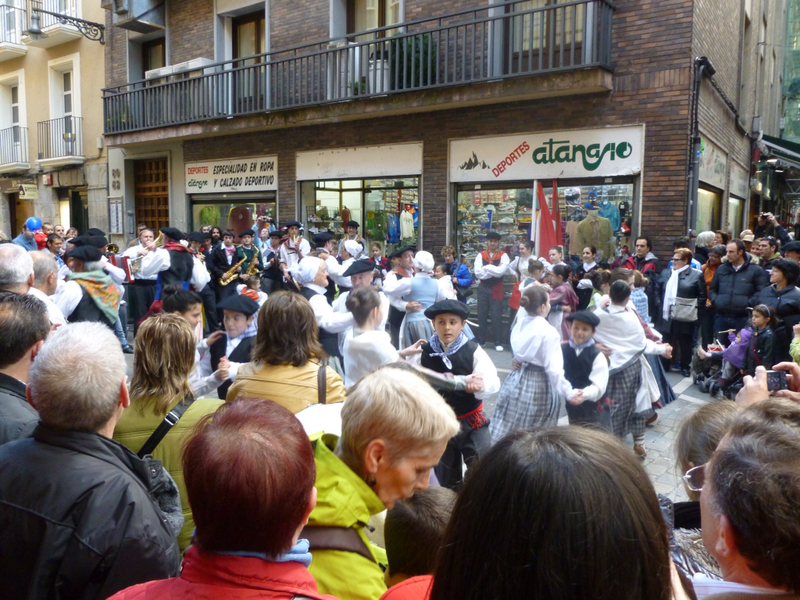 The Pamplona revellers partied all night, literally all night under our window. I am now up ready for breakfast and some are still out on our street, maybe winding down? They have to at some time you would think. 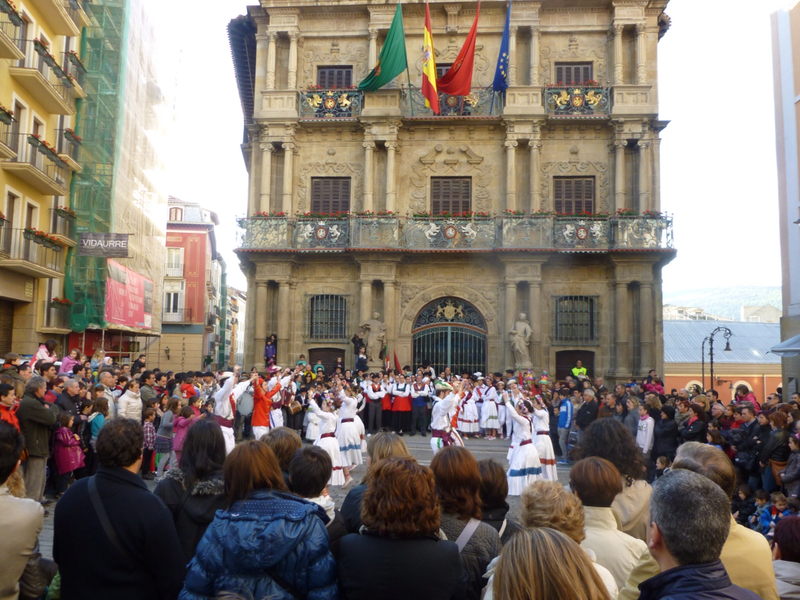 Karen, your post reminded me of a weekend night we spent in Pamplona at the Hotel Europa. It was a nice hotel just off Plaza Castillo and at 4AM there were still people partying outside our window. The locals love being out, enjoying life, in that plaza. Glad you and Dayton could join them. Maybe you can rest upon the train to Santiago. Really enjoying your blog.